Evaluations during TestFest, a three-day test-drive event. 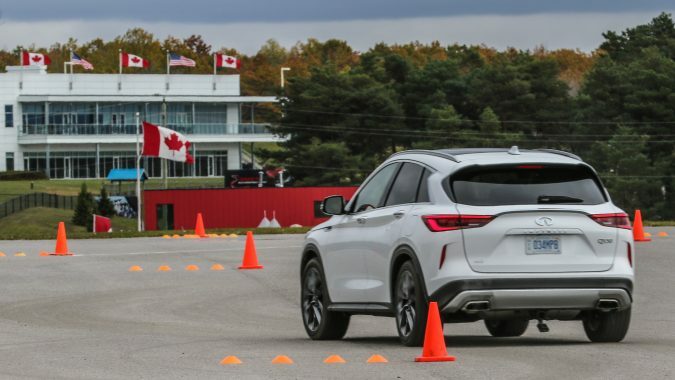 Last week a sizeable group of members from the Automobile Journalists Association of Canada (AJAC) descended on Canadian Tire Motorsport Park north of Bowmanville, Ontario to evaluate and vote on entries in the Canadian Car of the Year program. 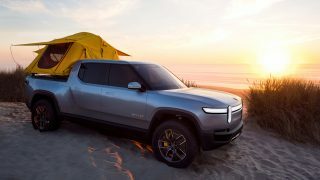 The gathering, known as TestFest, is a three-day test-drive event that brings together a wide variety of new and updated vehicles that are competing not only in their respective categories, but are also in the running for the top two awards – Canadian Car and Utility Vehicle of the Year. 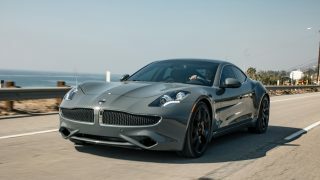 This year, there are 55 vehicles entered across 12 categories that cover a broad range of segments from pick-ups to large cars, small cars and premium electric vehicles (EV) to name a few. 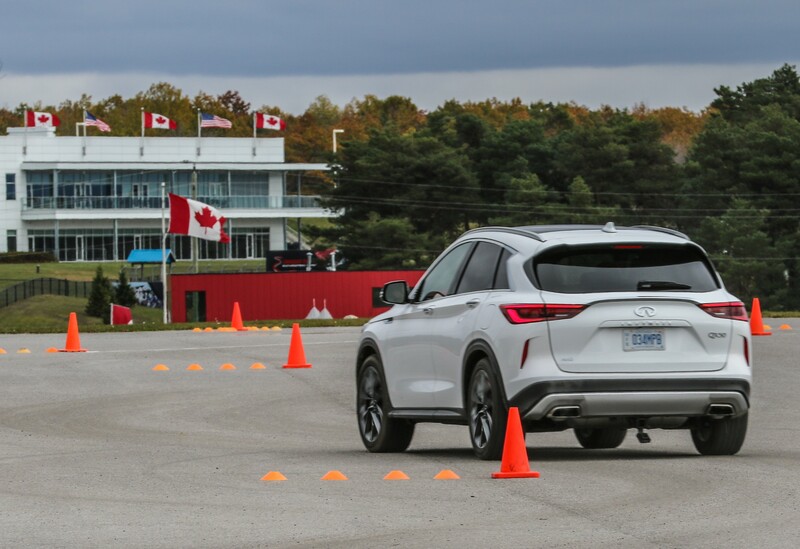 The evaluations took place on CTMP’s Driver Development Track (DDT), along with an off-road course, local roads in and around the track, and an off-road course designed especially for the four full-size pick-ups in the competition. 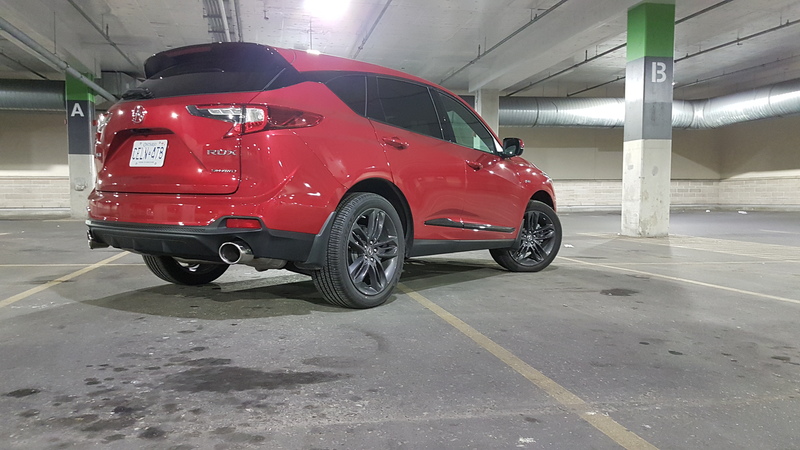 I’m tackling several categories for Wheels.ca and this time around it’s time to review the premium mid-size SUVs. 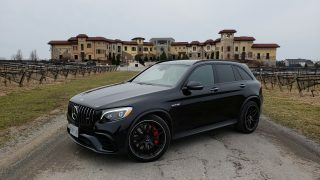 Note: The Mercedes-AMG GLC 63 S 4MATIC+ Coupe is also entered in this category but was unavailable for evaluation during the TestFest program. 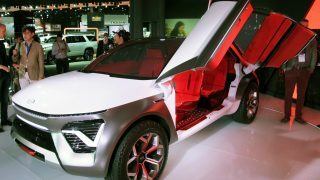 The first-ever Alfa SUV gives a good accounting of itself overall. 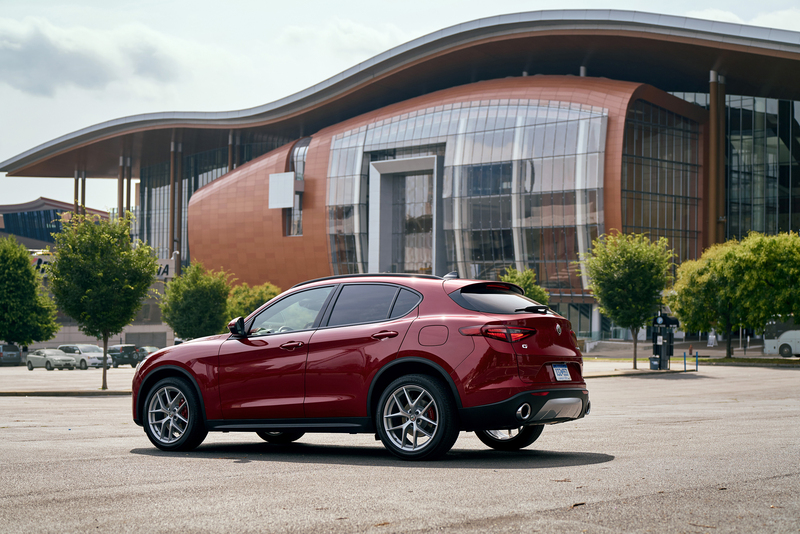 The Stelvio is unmistakably Alfa, with its triangle grille, massive front air intakes and curvy sheet metal that flares and bends in all the right places – it’s the sexiest looking entry to these eyes. 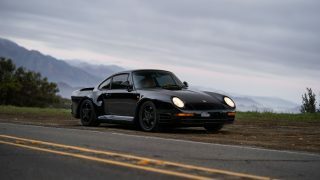 Same goes for the interior, which is for the most part, comfortable, well-finished and has a high degree of visual panache. Some of its Italian quirks were less endearing, like its oddly named driving modes (methinks DNA is a little on the nose), small infotainment screen, and hard to find odometer reset (found it, finally! ), but these are minor gripes in the grand scheme. On the road, the Stelvio delivers the sort of performance one would expect from a vehicle that wears an Alfa badge. Even though my test vehicle was equipped with a 2.0-litre turbocharged 4-cylinder (sadly, the Quadrifoglio wasn’t available), it delivered impressive acceleration, tight and well-sorted handling and excellent braking. It is the king of the autocross in this group. 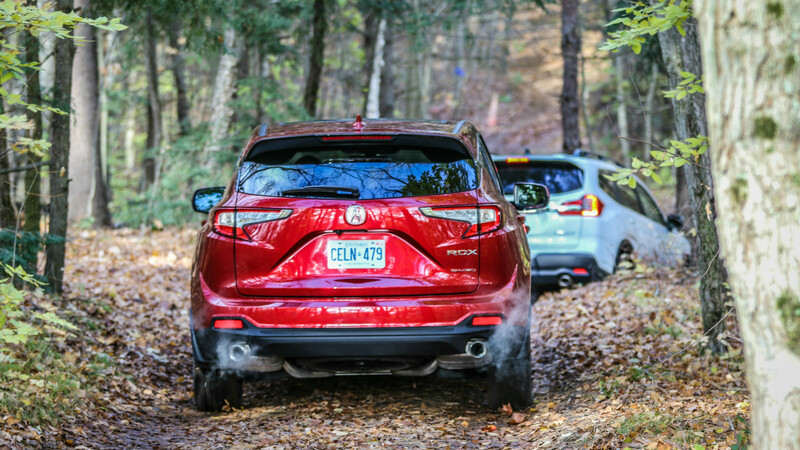 Legit off-roading isn’t the Stelvio’s forte, but the same could be said for the other entries in this category. 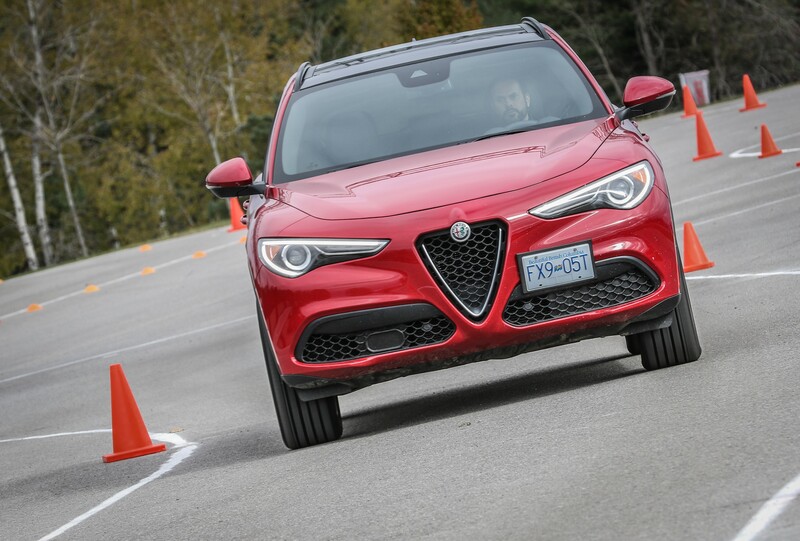 In sum, the Stelvio is as advertised with its strong performance profile, unique Alfa character and exciting Italian flair that is effective at separating it from its rather monolithic competition. 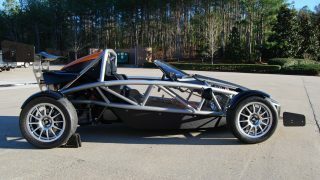 It has the most power in the group (280 hp / 306 lb-ft.) but is also the most expensive. 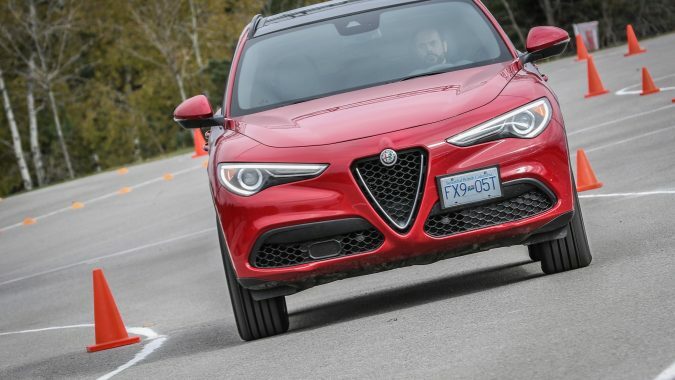 The Stelvio still delivers good value, I’d argue, given the mid-grade Ti Sport tester starts at $55,345, but in a group this competitive it’ll do no better than third. 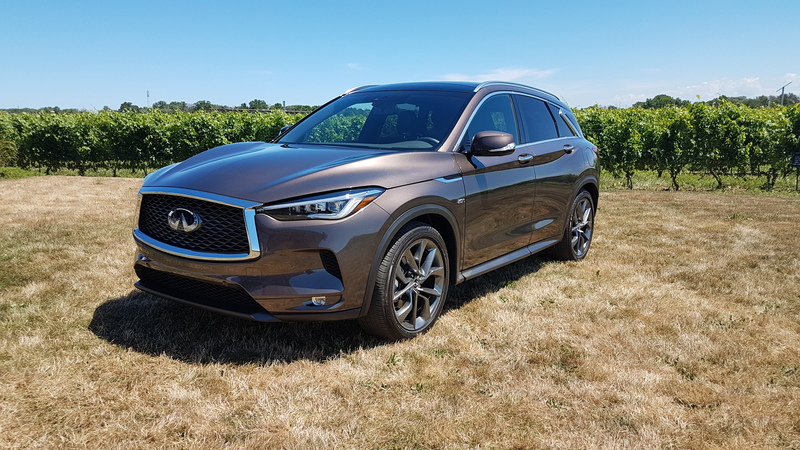 The Infiniti QX50 represents a huge sea change for the brand, as it casts out its old and stodgy predecessor in favour of a vehicle that is miles better in every way. And its not hard to understand why. The QX50 is a handsome vehicle, with Infiniti’s Powerful Elegance design language providing for a sleek, chiseled and taut appearance that gives it an air of elegance and performance. 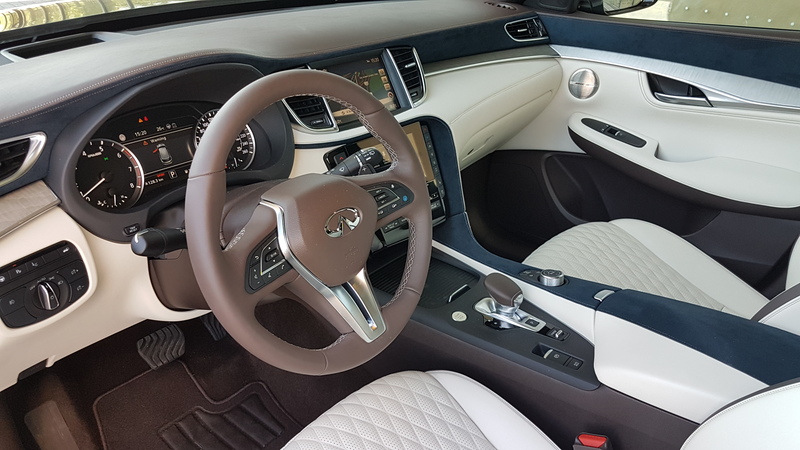 That feeling is carried into the cabin, where the QX50 is awash in pleasing shapes, fabrics and trim materials that evoke a sense of refined luxury. In terms of the drive, the 2.0-litre VC (variable compression) turbocharged 4-cylinder engine is a real game-changer. The ability to alter the engine’s compression ratio means, essentially, that the QX50 can deliver performance AND fuel efficiency depending on the driving style and drive mode – lower compression for better performance, higher compression for improved fuel efficiency. 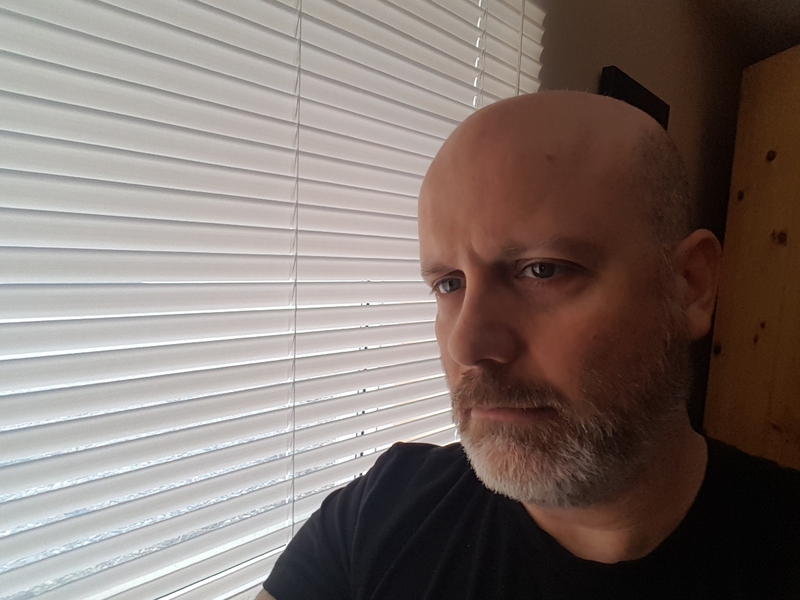 This is impressive tech – to say the least – and based on my experience, it delivers. The QX50 is the least powerful in the group (268 hp / 280 lb-ft.), but it didn’t feel appreciably slower than the Stelvio and RDX and returns better average fuel economy. It loses marks in my book for Nissan’s continuing mission to put CVTs into just about everything it builds and an infotainment system that is needlessly complex, but those don’t outshine its great design, finely crafted interior and impressive VC Turbo. It finishes second, but the margin is narrow. 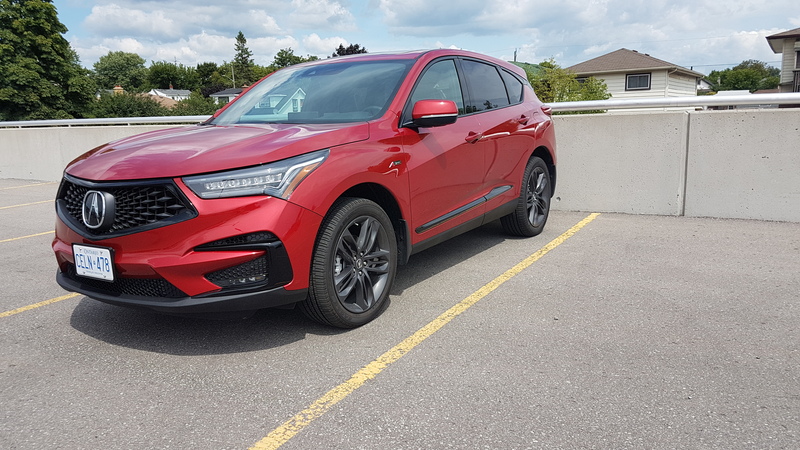 The RDX is the most impressive mid-size SUV I’ve driven this year and it is the best all-around performer in this category. It doesn’t have exotic Italian styling, but it’s quite handsome in its own way, as Acura’s Precision Concept design language has now spread throughout its entire lineup. It doesn’t come to market with a breakthrough innovation like the VC Turbo, but its 2.0-litre turbocharged engine 4-cylinder engine (272 hp / 280 lb-ft.), 10-speed automatic transmission and standard Super-Handling (SH) AWD serve the RDX just fine. 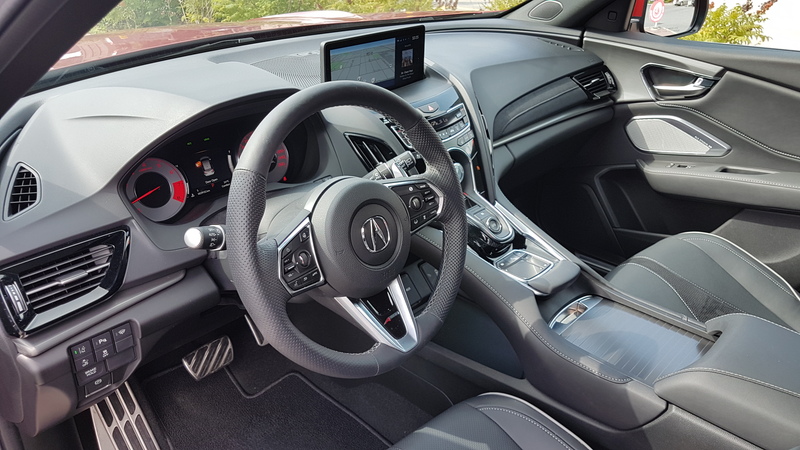 What Acura’s team of designers, engineers and product planners have created is a premium mid-size SUV that simply covers all the bases – the RDX is like a Venn diagram of 2018 consumer preferences. 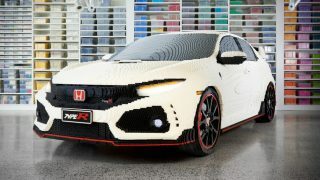 It has the lowest starting MSRP in the group, but each of its five trims comes with a lot of stuff for the money. You want performance? Each model gets the 2.0-litre turbo four, 10-speed auto and SH-AWD. What about safety? AcuraWatch, the brand’s suite of safety tech and driver aids, is standard on all models. Fine, what else does it come with? A lot. 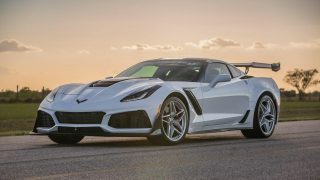 19-inch alloy wheels, LED headlights, panoramic moonroof, 10.2-inch HD infotainment display, 12-way heated driver and passenger sport seats, Apple CarPlay and more. All standard on all models. 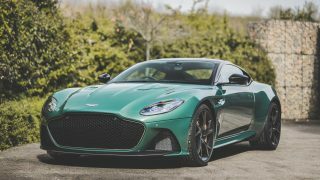 I drove the mid-grade A-Spec model ($50,290 MSRP), and was very impressed with its handsome styling, sharp acceleration, tight handling and sporty interior. While I think the touchpad interface for the infotainment system is needlessly fussy and distracting, my hope is Acura comes to its senses and replaces it in the years to come with a knob as the ergonomics gods intended. I have less hope for the push-button, pull-tab PRNDL controls, however. They lack intuition and can easily confuse, but I think they’re here to stay. These are small blemishes, however, on a truly great mid-size SUV. 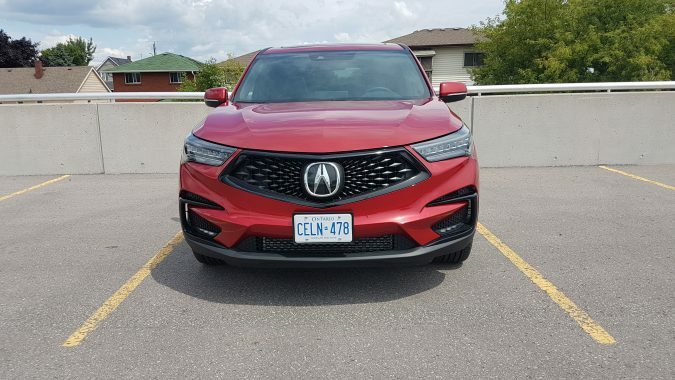 The Acura RDX should win this category and will get some deserved consideration for Canadian Utility Vehicle of the Year.